We quantify the strength of miRNA–target interactions with MIRZA, a recently introduced biophysical model. We show that computationally predicted energies of interaction correlate strongly with the energies of interaction estimated from biochemical measurements of Michaelis–Menten constants. We further show that the accuracy of the MIRZA model can be improved taking into account recently emerged experimental data types. 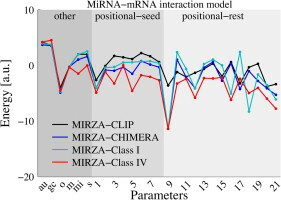 In particular, we use chimeric miRNA–mRNA sequences to infer a MIRZA–CHIMERA model and we provide a framework for inferring a similar model from measurements of rate constants of miRNA–mRNA interaction in the context of Argonaute proteins. Finally, based on a simple model of miRNA-based regulation, we discuss the importance of interaction energy and its variability between targets for the modulation of miRNA target expression in vivo.